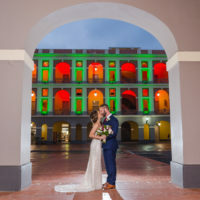 Kary & Esteban wished to have their engagement photos in anticipation to their wedding in the timelessly magical streets of Old San Juan. While driving to the area, we could see how the day was not the “ideal” to shoot. They decided to go forward with it, and we had such a beautiful time together! We took a lot of stops because of the rain, took pictures inside of hotels while we waited, but if was nothing short of perfect. I loved their positive attitude and disposition to roll with everything I proposed throughout the afternoon! Hope you enjoy this set!